Not only that, but there are detailed instructions on how you can make it! Ugh. 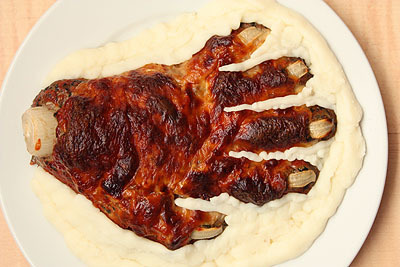 See not martha – Meat Hand for more details. Honestly, I never got the entire let’s-make-food-look-disgusting idea. But if you want to make something gross for Hallowe’en, this could be it. The great Canadian photographer, Ed Burtynsky, has a new exhibit showing at the Corcoran Gallery of Art. It’s called “Oil”, and it looks at the effects of oil in our lives. Just that alone got me excited about it. Anyone fortunate enought to be in the vicinity of that gallery in the next while should visit. If you’re like me, when you think of stout, you think…well, Guinness. 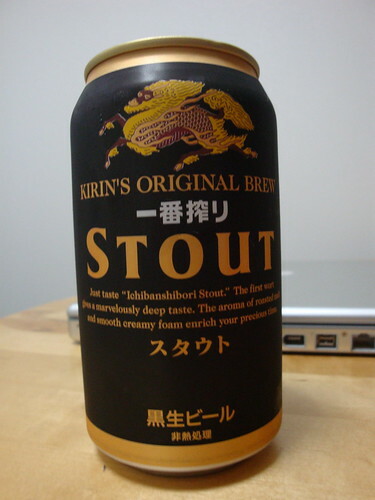 I love Guinness, and I enjoy the rich darkness of stout generally. What was surprising to me, though, was after reading this article, Beers of The Times – Call It Stout, Though It Isn’t – Review – NYTimes.com, I learned that a) stout generally isn’t as heavy as I thought, and b) there are alot more good stouts out there other than the grand stout from Ireland. “…our No. 1 beer, Black Hawk Stout from Mendocino Brewing, which has breweries on both coasts, evoked visions of classic Irish stouts. It was light and dry, yes, but graceful and deliciously refreshing, too. I could see it easily becoming my new midday or ballgame tipple. Would somebody please get Yankee Stadium on the phone? The colours in the room are well coordinated. There are blue and green tones throughput, from the walls to the tables to the pillows to the lamps. There is also a nice mixture of bold colors and neutral colours, with the bigger pieces being neutral and the furniture being darker. Overall, though, the room is light, and the mirrors help bring that out. There are few arms on the furniture, and the bed has no footboard. This helps in a limited space. As well, the coffee tables are stackable, which is also versatile. A nice little package of an apartment. Listen to Nneka now. Everyone else will later. When I saw this photograph on James Fallows blog by the Chinese photographer, Lu Guang (卢广), I immediately thought of England in the 19th century. (This photo is a power plant in Inner Mongolia.) Like England in the 19th century, China is growing powerfully, with all the good and bad that comes with that. How China deals with will affect everyone. It’s the opposite of digital cameras with the increasing megapixel ranges. It’s not even 35 mm film. It’s 120. It comes on a spool. After every picture, you have to manually set it to the next picture. I love that! Almost the entire camera is plastic. Even the lens. That low quality makes for more interesting photos. There are still lots of places in Toronto to get 120 film developed. Likely for other cities as well. There was a long discussion forum on flickr talking about all the places that develop it in the city. I was afraid it would be hard to get it done, but in fact it’s very easy. There are a number of flickr groups dedicated to photos taken by Diana owners. Even the most basic picture taken by a Diana camera has a nice look to it. You can do multiple exposures easily. You can use it as a pinhole camera. It can either be automatic or manual shutter speed. When people see it, they want to ask you about it and they start talking about photography. It’s still fun waiting and seeing your photos developed. It has just enough controls on it to make it interesting and give you things to play with, but not too many. It has a great vintage feel to it. This camera is new, but it is based on cameras of the 1960s. It just looks cool, doesn’t it? You can find more about it here: Diana F+ camera, but there are lots of sites that talk about the camera. Thanks to the the Tech Style blog for pointing it out, and for Urban Outfitters for carrying it. You can get them cheaper on eBay, but I liked the package it came in at Urban Outfitters. If anyone is interested in the camera, let me know. I am also bookmarking interesting links on delicious.com.